The Bulldog Click Lock Box, comfortable aluminum case with Click Lock and The Bulldog logo on the top. The Bulldog Amsterdam Click Lock Box is a comfortably round container in aluminium. 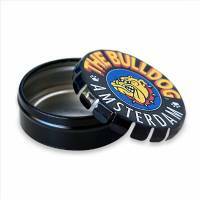 This comfortable and fashionable case has The Bulldog Amsterdam logo, a diameter of about 55mm and close thanks Click Lock. Perfect also to bring your tobacco.